1. If you could change something about your experience, what would it be? 2. Do you have suggestions for improvements to our rental space? 3. Did you notice a lack of expected supplies? 4. Do you have anything else you want to let us know? The Meeting House at Priest Point has its origins as The Salmon Club, build in 1962 as a hall for enterprising fishing buddies. In 2010 Olympia Friends Meeting (Quakers) purchased the facility from the American Legion (the second owners) and began ongoing improvements to better serve both the Friends Meeting and the wider community. The photo here is from 1963, looking west from Boston Harbor Road. 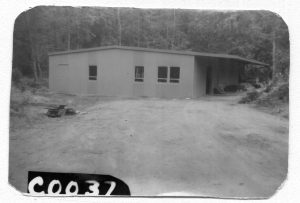 It was taken by the tax assessor shortly after construction was completed and before landscaping and building additions.